The final race in the fantastic Sydney OceanSeries, and undoubtedly the hardest was the 20 beaches, starting all the way from the top of Sydney’s northern beaches at Palm Beach, and finally finishing at Freshwater SLSC, some 23km later. After racing in all the events in this year’s series, and leading the women’s overall pointscore, I was hoping for a strong result to secure my spot at the top of the women’s category, and win that plane ticket to attend any surfski race in the world. However, knowing the calibre of the field that the 20 Beaches normally draws, I knew the women’s field was going to be bigger and stronger than any of the races this year. I was not wrong, with Queensland ski specialists Kirsty Homes, Kelly Jury, flatwater paddlers Bernadette Wallace and Alyce Burnett, and even New Zealand’s Katie Pocock making the trip over to race. Despite a small dilemma in deciding whether to swap boats to a smaller volume one just before the race, we were soon headed out off Palm Beach. (I decided to go with the M Volume Nelo). As usual, the start of the race involved a lot of hustle and bustle, with most paddlers jostling for position on the line right up till the siren was blown. I got off to a really good start, probably my best start all year, and found some clean water and nice wash off the back of a few male paddlers for the first section of the race. The wind was at our backs from the get go, and I took off hard trying to take advantage of my good start, and the runners that the wind was providing. As far as I could tell I was leading the ladies race, until about 3 or 4km in when Kirsty Holmes pulled up along side me and went past me. I set off on her tail following her for about half the race and trying not to let her get too far in front. For the most part, I managed to keep her lead on me to about 50-100m, but at about the halfway point she pulled away and increased her lead on me to about 200-300m. At this point I tried to concentrate on keeping her lead to a minimum, and started to link up some great runs coming past Long Reef. I was still feeling pretty good at this point, and was able to work really hard on the runs. I still couldn’t see Kirsty and thought that I would have second place wrapped up if I kept up this pace. This good feeling was soon interrupted at about 5k to go by a strong westerly wind that changed the race dynamics and had us struggling against a strong side wind/chop. I kept my head down and really tried to grind it out rather than letting the wind push me around. I could see Manly and Freshie in the distance now and knew that there was not far to go. All of a sudden I had a look around and spotted Kirsty. She was about 100m further into shore than me, but I had about a 50m lead on her. This was it for me and I decided to really give it all I had for the remainder of the race. I could see my lead increasing as we headed towards the final finishing buoy, and despite the last 2-3km slog into a headwind, knowing that I was in the lead made the pain go away for a little. Thanks so much to Team Nelo, and Jimmy and Nigel for helping me out on the day with my last minute boat changes! 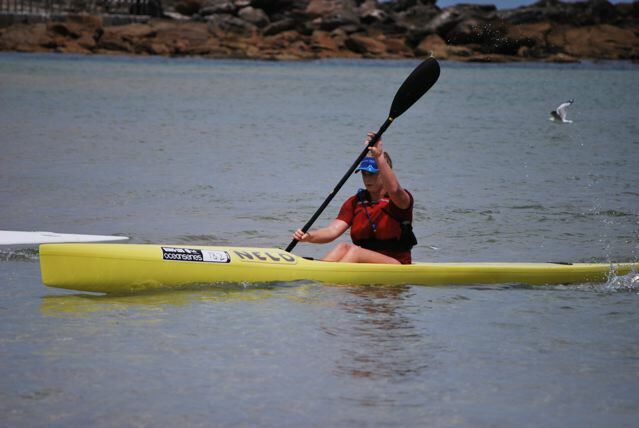 Also a big congratulations to all the other Nelo Surfski paddlers out there yesterday, a great effort taking out the open men’s, women’s, junior women’s, over 40’s and over 50’s categories. Awesome boats! Overall, the 20 Beaches was a great race, with a high quality field, which is increasing in numbers every year. The conditions ended up being great and I was stoked to get a win in such a race.